Latitude from the Midday Sun Finding Latitude in a Survival Situation. For this method, we need to know the Sun’s declination which we can take from a nautical almanac, a web site or phone app. However, in a survival scenario, especially in an ‘escape and evasion’ situation, it is extremely unlikely that we will have access to sat navs, computers, smart phones or nautical almanacs. So, what is needed, is a method of calculating the Sun’s declination without reliance on any aids whatsoever and the method described below fits that criterion exactly. 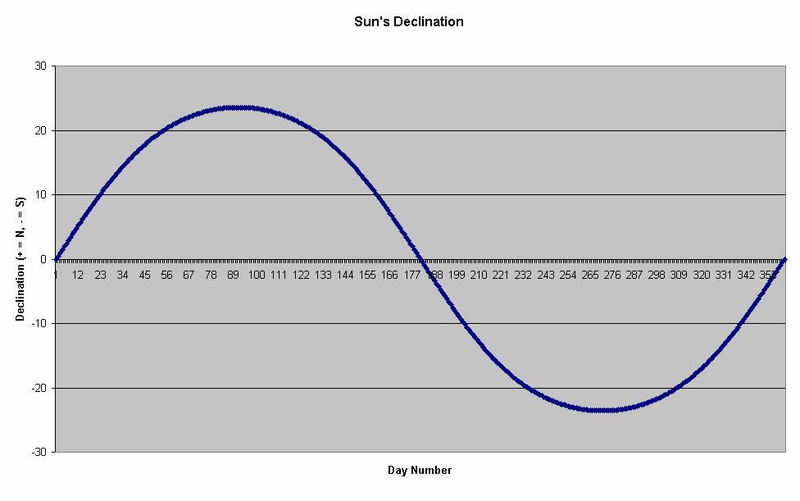 The method which is fully explained in the book ‘Understanding Astro Navigation’, evolved from the discovery that, if the daily values of the sun’s declination are plotted on a chart, as shown below, the resultant curve will closely follow a sine wave with an amplitude of 23.5 and a period of 365. The amplitude ± 23.5 of course, corresponds to the northerly and southerly limits of the Sun’s declination and the period of 365 corresponds to the number of days in the year (discounting leap years). The day numbers, along the x-axis, commence with 1 on 21st March (the vernal equinox) and continue to 365 when the next vernal equinox is reached. Because the daily declination values are averaged over the leap year cycle, the 366th day of the leap year is ignored and so for the 29th February, either day 365 or day 1 is used. (There will be a negligible difference between the values shown for these days). Method 1. This method requires the use of a scientific calculator or set of trig tables and is not really suitable for a typical survival situation when these items are not likely to be available. However, it is useful to work through this method in order to better understand the non-calculator method. The discovery that a graph of the values of declination follow a sine wave led to the derivation of the following formulas for calculating the declination on any day of the year. Because of small variations in the patterns for the two halves of the year, separate formulas were necessary. 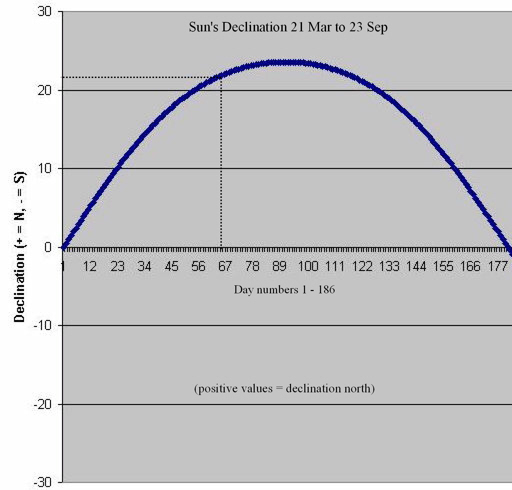 For the period 21 March (vernal equinox) to 22 September (autumnal equinox): Declination = 23.5 Sin(0.973n) where n is the day number. Method of use. The following examples demonstrate the use of these formulas. Example 1. Calculate the Sun’s declination on 27th May. Using a calendar, count the days from 21st March to 27th May. (If you don’t have a calendar, use the mnemonic rhyme ‘30 days has September’ which is repeated below). If the date is 27th May, the day number is 67. Therefore, Dec = 21.3o North (positive values indicate north). 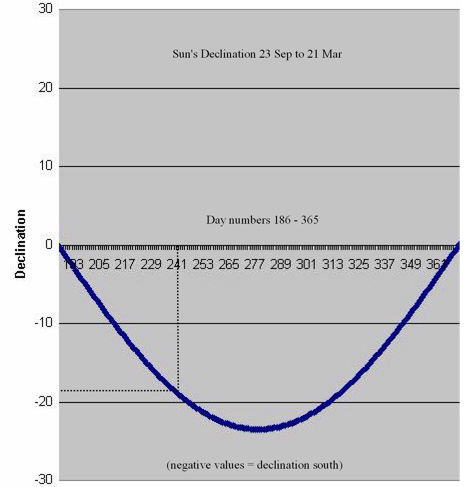 If we check this result against the Sun’s Declination Table, we will find that the correct declination for 27 May is 21.2o North giving an accuracy of ±0.1o for our result which is within tolerance. Example 2. Calculate the Sun’s declination on 18th November. Count the days from 21st March to 18th November to find the day number. The day number for 18th November is 242. If we check this result against the Sun’s Declination Table we will find that the correct declination for 18th November is 19.1o North giving an accuracy of ±0.6o for our result. Method 2. Calculating the declination without using calculators, sine tables and calendars. To make use of the formulas above we obviously need to use trigonometry tables or a scientific calculator as well as a calendar to work out the day number. However, it more than likely that we will not have access to any of these in a true survival scenario. All is not lost though because by using the knowledge gained above, we can make do without these things. 1. Simple things first, if you don’t have a calendar you can use the mnemonic rhyme ‘30 days has September’ which is repeated below). ’30 days has September, April, June and November; all the rest have 31 except for February alone which has 28 days but 29 in a leap year’. Using this rhyme, you can easily make your own rough calculator to work out the day number. Having worked out the day number, the next task is make a simple graph of the declination curve for the current period of the year. This is much simpler than it might at first seem. Consider the graph of the sine curve for the period 21st March to 22nd September shown below. You will see that the day numbers are marked along the x-axis from 1 to 185 (185 being the day number for 22nd September). From the graph, you will see that the curve of the declination values creates a parabola with the vertex at 23.5 (the maximum value of the Sun’s declination). Draw a horizontal number line with graduations from 1 to 185. This will be the x-axis of the graph. Mark off equal graduations from 0 to +23.5 up the y-axis. Mark a point at the co-ordinate of x = 92 and y = 23.5; this will be the position of the vertex of the parabola. (Day 92 is 21st June, the Summer Solstice or Midsummer). Carefully draw a smooth curve from 0 on the x-axis through the vertex at y = 23.5 and back down to 185 on the x-axis to form a parabola as shown on the graph below. The copy of the graph is now complete. To find the declination on a certain day. Example 1. Using the data from example 1 above, find the declination on 27th May (day no. 67). As shown on the chart above, draw a vertical line from 67 on the x-axis until it meets the curve. From the point where the vertical line meets the curve, draw a horizontal line across to the y-axis and read off the declination. From the chart, you will see that the resultant declination is 21o north (± 0.5o). From the Sun’s declination table, we know that the declination on 27th May is 21.2o and this shows that our result is reasonably accurate. Example 2. Using the data from example 2 above, find the declination on 18th November (day no. 242). Using the method explained above, create a graph of the declination curve for the period 23rd September to 21st March as shown in the chart below. Use day numbers 186 to 365 for the x-axis. Mark a point at the coordinate of x = 276, y = -23.5 to find the position of the vertex of the parabola. (day no. 276 is 22nd December, the Winter Solstice). Carefully draw the curve from x = 0 on the x-axis through the vertex and back to x-axis at x = 365 as shown below. Draw a vertical line from day no. 242 on the x-axis down until it meets the curve. From that point, draw a horizontal line across to the y-axis and read off the declination. From the chart below, you will see that the resultant declination is -19 i.e. 19o south (± 0.5o). From the Sun’s declination table, we know that the declination on 18th November is 19.1o south and this shows that our result is well within tolerance. ‘Astro Navigation Demystified’ is available from Amazon and from Nielsen Books. This entry was posted in astro navigation, Survival and tagged amazon, astro navigation, astronomy, book, celestial, celestial navigation, celestial navigation for dummies, celestial navigation made easy, celestial navigation training, eBook, mathematics of celestial navigation, navigation, survival, survival - navigation. Bookmark the permalink.